When buying a product in the store, purchasing a new car, or taking prescribed medicine, you trust that that product has been tested to ensure its safety. However, many times, negligent manufacturers put innocent people at risk by putting defective products on the market or failing to provide adequate safety warnings. If you suffer an injury or lose a loved one because of the manufacturer’s negligence, you will need an experienced product liability lawyer to help you with your case. The product liability lawyers at Munley Law have a national reputation for obtaining justice on behalf of their injured clients. With more than 55 years of experience in product liability cases, we fight for those who have been injured or killed as the result of a defective product. Our board-certified civil trial advocates have consistently earned rankings among the Best Lawyers in America. 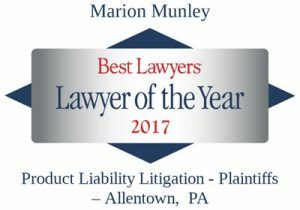 Marion Munley earned the title of Product Liability Lawyer of the Year, 2017. If you or someone you love have been hurt by an unsafe product, contact us today for a free consultation. There is no fee unless we win your case. We are currently reviewing cases involving auto recalls (including Takata airbags), explosive e-cigarettes, and other harmful consumer products such as IVC blood clot filters, Stryker hip implants, Taxotere chemotherapy treatment, or talcum powder that has been linked to ovarian cancer. Pennsylvania is a “strict liability” state. This means that you don’t need to show that someone’s negligence caused your personal injury. Rather, you need to show the existence of the defect and a relationship to the harm it caused you. Anyone in the chain of distribution can be held liable, including manufacturers, wholesalers, distributors, retailers or lessors. Our product liability lawyers have successfully represented those who have suffered injury from defective products. We understand the complexity of product liability laws and the challenges of proving a case. Research, investigation, and skilled litigation can be crucial to success, including the ability to explain to a jury what happened and why through pictures, models, computer animations, or expert testimony. We use the latest technology in all of our cases to help those injured by faulty products to get the best settlement or jury verdict possible. At Munley Law, our lawyers work as a team, using their collective knowledge to make sure that our clients get the justice they deserve. If you’ve suffered an injury by a defective product, don’t wait a minute longer. Use our easy online form to contact us with your questions or call today at (855) 866-5529. The consultation is free, and we do not charge any fee unless we win your case. If you think you may have a product liability case, contact us now for a FREE consultation.